Culms: Erect, stiff, slender, strongly triangular, rough above, often shorter than leaves, bases dark brown. Leaves: Blades 3 to several, clustered near base, mostly flat, to 4 feet long, less than 1/4 inch wide, glabrous; margins rough. Sheaths: Open, tight, wrinkled cross-wise, inner surface greenish white. Inflorescences: Spikes, bisexual, in narrow heads 1.5 to 4 inches long, to 3/5 inch wide; spikes 15 or more, clustered closely together, occasionally separated by spaces between spikes, sessile, densely flowered, ovoid-oblong, to 1/3 inch long; staminate flowers above pistillate flowers; bracts at bases of most spikes, bristle-like, to 2 inches long; pistillate scales ovate, as long or slightly longer than perigynia; margins greenish brown to transparent; centers green; tips strongly awned; perigynia ovoid, flat, green or yellowish brown; beaks about as long as body of the perigynia, 2-toothed. Fruits: Achenes, lens-shaped, reddish brown, 1-seeded; stigmas 2, reddish brown. Habitat: Wet ditches, ravines, prairie swales, edges of marshes, springs, lakes, and ponds, most abundant in clayey soils. Comments: A widespread and abundant species of Carex. 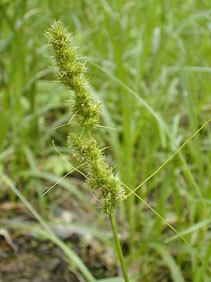 The distinctive inflorescence makes fox sedge easy to identify.